Visit us for Happy Hour from to 3-7pm every day! Wing night is Thursday......55 CENT wings 4-9pm Dine in Only! Welcome to Fokkers Pub and Restaurant, where you can always feel comfortable pulling some tables together with your friends and staying as long as you want. We are a fun, edgy, high-energy and easygoing restaurant - much like the personalities of our guests. Since 2007, we've been striving to wow our guests and it's worked- we're recognized as the best pub restaurant in Fort Walton Beach, FL! If you're looking for hand tossed pizza, we've got it. If you're looking for wings, we've got them. We have the best German food on the Emerald Coast! We are open 7 days a week and celebrate happy hour every day 3-7pm! Stop by for a cold beer on tap and stay for the atmosphere! Our Thursday Night Wing Night is famous around town- wings only 55 cents 4-9pm Dine in Only! We get down with live music every Wednesday and Friday. If you're a sports fan, let us take care of you while you enjoy the game on one of the several televisions in our sports bar! Bring a date, the family, or just yourself, take a seat in our outdoor pavilion and see for yourself what makes us the best pub restaurant around! Fokkers is where the best German food, cold beer and hand tossed pizza come together to satisfy any craving! And while you're chowing down, take a look up at the ceiling for a surprise! Call us today to order a hand tossed pizza! Sometimes, there's nothing you crave more than a hand tossed pizza. A delicious, flaky crust, melty cheese, all the toppings you can eat: it doesn't get much better than that. 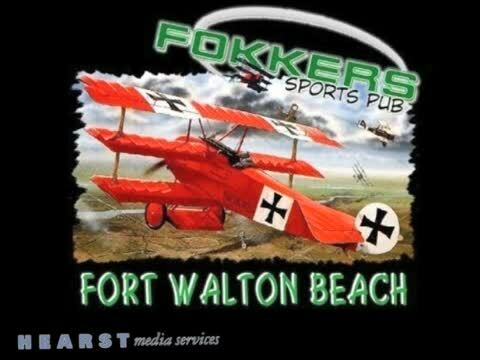 And there's no better pie Fort Walton Beach, FL than the hand tossed pizza at Fokker's. If you're looking for the pizza that's going to please even the pickiest eater, stop by Fokker's tonight. You'll be glad that you did. We offer take -out on all menu items to save you time! We are located on the north side of Highway 98 (Miracle Strip Pkwy) between Perry and Ferry Rds. Stop by for the best German food in Fort Walton Beach, FL! We would love to introduce you to the best pub restaurant around. You will be sure to love our hand tossed pizza and authentic German food.